Is Sean Couturier a Franchise Player? When it comes to the face of the franchise, Philadelphia Flyers captain Claude Giroux unmistakably fills the role. And then there’s Scott Hartnell and Kimmo Timonen, who are both in their seventh year with the team. The list goes on, but you get the idea. But with Sean Couturier, several things stand out, which begs the question, is Couturier a franchise player? Sean Couturier has been a difference-maker since he was drafted eighth overall in the 2011 NHL Entry Draft. At just 18-years of age, Couturier’s presence at training camp forced head coach Peter Laviolette to keep the inexperienced center on the big roster for 77 games of the 2011-12 season, as well as the playoff roster. Couturier’s defensive mastery not only left an impression on Laviolette in training camp, but on the league’s best players throughout the year as well. In his first NHL playoff series, Couturier, then 19, was given the monumental task of mirroring Penguins star Evgeni Malkin. Throughout the six-game series, which the Flyers would go onto win, Couturier left the NHL’s leading scorer without a point in two of them. In 19 games against Pittsburgh throughout his early career, Couturier’s shutdown defense has tortured the Pens. When the two teams met earlier in March in a vital home-and-home series, Couturier was asked to duplicate his 2012 performance against Malkin with this year’s point leader, Sidney Crosby. For the 2011 first round draft pick, it was ask and you shall receive. The 21-year-old hounded Crosby like a repo man, holding the Penguins captain scoreless against the orange and black for the first time in 46 regular season games. Couturier has shined equally as bright on Philadelphia’s penalty kill, which killed off 36 of 37 power plays in the 10 games leading up to Sunday’s loss to Boston. The Flyers PK, which ranks fifth in the entire league, hasn’t found success through a lack of penalties either. Philadelphia is easily the NHL’s most penalized team, racking up 1,100 PIM’s with 401 penalties through 74 games. A Case For The Selke Trophy? The Frank J. Selke Trophy is awarded every year to the most outstanding defensive forward in the league. Past winners include, Jonathan Toews, Patrice Bergeron, and Pavel Datsyuk. For Couturier, winning the Selke Trophy would most assuredly declare Couturier a franchise player. But even if the 2010-11 Mike Boss Trophy winner doesn’t win the Selke, it doesn’t necessarily mean he’s not. 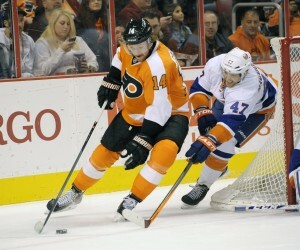 “Couturier, 21, deserves consideration for the Selke Trophy, given to the league’s best defensive forward. He won’t come close to winning it because the award has morphed into a reward for a forward who is dominating both ways, and Couturier’s offense is still in the growing stages. Couturier showing each and every game why he should be a perennial Selke Trophy candidate for the next decade. Keeping the Selke Trophy from Couturier for offensive reasons not only ignores his impact in the faceoff circle, but completely negates the entire meaning of the award in the first place. The third-year center has increased his faceoff percentage, as well as his average time on ice, while notching 36 points. Couturier’s average ice time of 19:09 trails only Claude Giroux’s average time of 20:36 for most minutes among Flyers forwards. Still, Couturier’s plus-one rating and 36 points is a country mile from other potential candidates such as Toews, Bergeron and Datsyuk. And even if his inconsistent scoring keeps him from the Selke this year, there’s plenty of time for “Coots” to have his name in the hat for years to come. 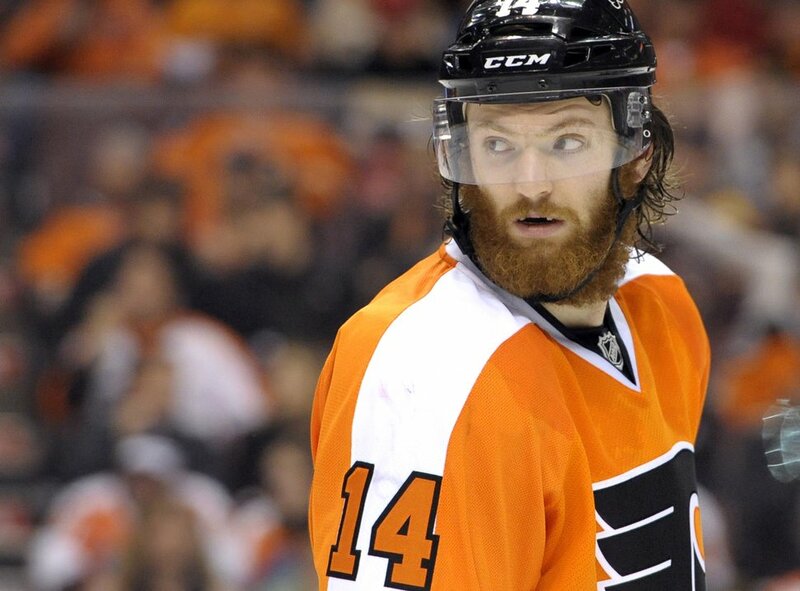 If you have an issue calling Couturier a franchise player, or even potential franchise player, consider his age. With the majority of the criticism lingering around his offensive totals, the third-year center has already eclipsed his single season best in points thanks to his 26 assists through 74 games. And although Couturier ended his rookie campaign with a plus-18 rating, his plus-one rating this season isn’t as bad as it seems when Philadelphia’s disastrous start to the season is taken into consideration. If Couturier hasn’t gotten any bigger or stronger, it’s news to everyone else. Flyers head coach Craig Berube is beyond pleased with what the 6-3, 197-pound Couturier brings. The overall offensive numbers alone may not make Sean Couturier a franchise player right now. But his elite defensive skill set, along with an entire career in front of him, suggest he will be – sooner rather than later.